A suspected ISIS scumbag was, how do you put it…blown up in a massive airstrike. Yup, that will work! So, what caused this explosion to happen? 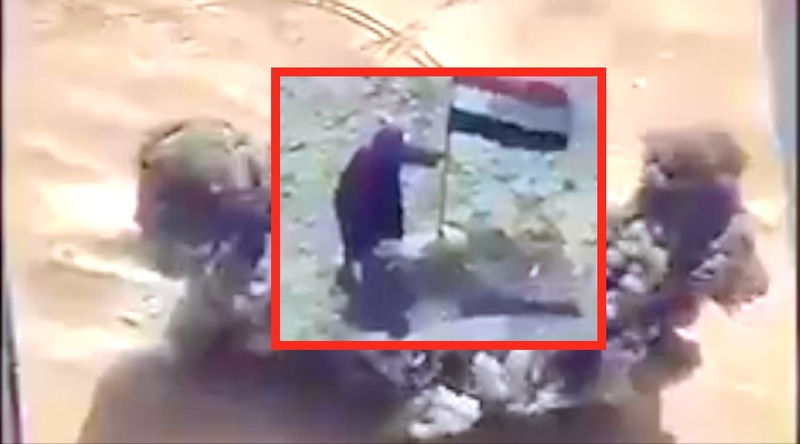 The fool decided to yank an Iraqi flag out of the ground. Aerial video of the scene shows a man moving on foot towards a flag in the desert outside war-torn west Mosul, the front line in the battle between the terror group and government forces. As he attempts to lift it out of the ground, a huge explosion demolishes a truck parked nearby, sending a giant plume of smoke up into the air. According to Al Arabiya, which showcased the video, there was a second explosion that was the one that actually took out the suspected ISIS scumbag. Unfortunately, that was off camera, so you sickos are just going to have to use your imagination. The dating of the video is not clear, as well as what country actually started the strike. But an informant told Al Arabiya that a Jihadist had tried to take the flag down in an area controlled by the Iraqi Army. Other militants were too scared to approach the body of their fallen comrade for Allah, believing that they too would be the next to be blown up, Al Arabiya reports. ISIS is the scum of the earth and though this video could not show the actual scumbag being blown sky high, rest assured that he got his just due. It’s a disappointing phenomenon that a rogue wannabe Caliph like ISIS can actually still exist and put up a decent fight this far into 2017. This is either a sign that they are truly the best fighters in the whole world… or more likely, that the nations fighting against them have not taken their actions seriously enough to finish the job.